What does PPSV23 stand for? 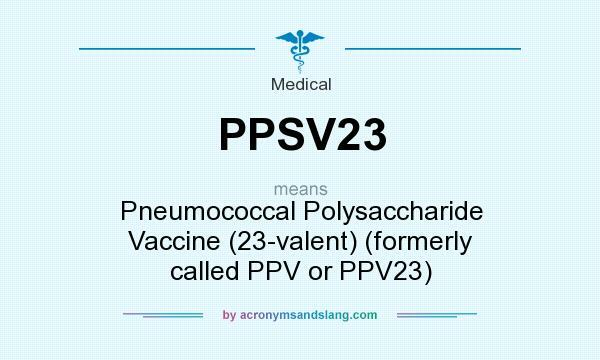 PPSV23 stands for "Pneumococcal Polysaccharide Vaccine (23-valent) (formerly called PPV or PPV23)"
How to abbreviate "Pneumococcal Polysaccharide Vaccine (23-valent) (formerly called PPV or PPV23)"? What is the meaning of PPSV23 abbreviation? The meaning of PPSV23 abbreviation is "Pneumococcal Polysaccharide Vaccine (23-valent) (formerly called PPV or PPV23)"
PPSV23 as abbreviation means "Pneumococcal Polysaccharide Vaccine (23-valent) (formerly called PPV or PPV23)"